Japan's Deputy Prime Minister Taro Aso has met China's Vice-Premier Zhang Gaoli in Beijing, fuelling speculation of a possible meeting between the two countries' leaders. Relations have been strained since Chinese President Xi Jinping and Japanese PM Shinzo Abe took office. But it is thought they may meet on the sidelines of a regional economic summit in Beijing in November. The countries are at odds over an island chain in the East China Sea. They also differ over Japan's actions in China during the Second World War. The BBC's Martin Patience in Beijing reports that the brief meeting between the countries' deputies will be taken as a sign that the leaders want to improve relations. However it is unclear whether the two countries will agree to what would be a politically sensitive meeting, our correspondent says. Mr Aso met Mr Zhang at a forum of finance ministers from the Asia-Pacific Economic Cooperation (Apec) group of countries. Beijing will be hosting a summit of Apec leaders next month. The disputed, uninhabited islands are known as the Diaoyu islands in China and the Senkaku islands in Japan. Currently controlled by Japan, the islands are close to important shipping lanes, offer rich fishing grounds and lie near potential oil and gas reserves. The dispute has become increasingly tense over the past two years. In November 2013, China announced the creation of a new air defence identification zone, which would require any aircraft in the zone - which covers the islands - to comply with rules laid down by Beijing. 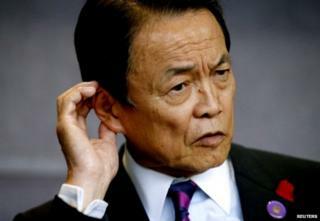 Japan labelled the move a "unilateral escalation" and said it would ignore it. China v Japan: Who is at fault? Viewpoints: How serious are China-Japan tensions?